When we previously discussed the practices of Yezidi faith, you may have noticed that there really are few things that Yezidis participate in corporately. They don’t have regular weekly or daily religious requirements. The main uniters of their faith are their yearly pilgrimages and holidays. There are four primary holidays; each can last for up to a week. Let’s begin in the beginning — New Year. 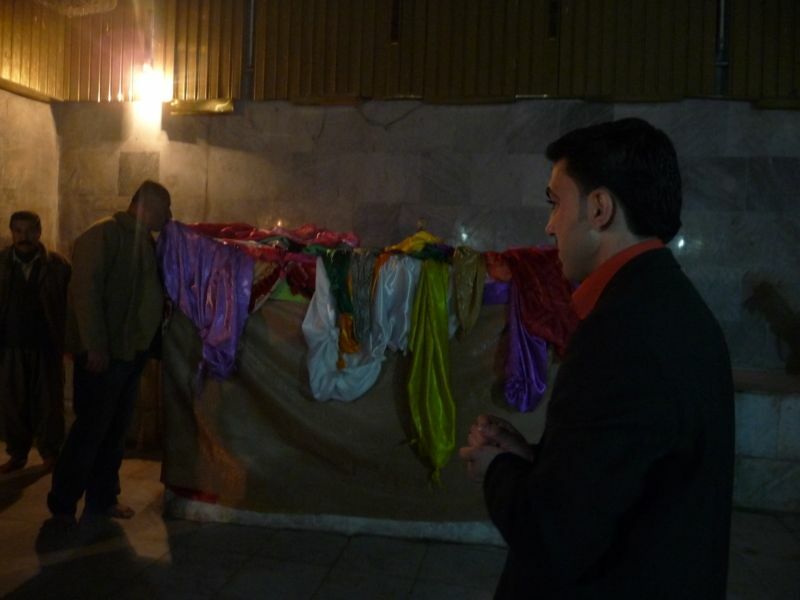 Yezidis celebrate the start of a new Year on the first Wednesday of April. It’s commonly referred to as Red Wednesday. According to tradition, Red Wednesday is the day the Peacock Angel descended to the newly made earth, cracked its icy shell, and caused it to sprout with vegetation. The day begins with a feast held in honor of the dead. The women gather in the graveyards with pots full of food. A banquet is laid out over the family graves and the sacred musicians sing songs in remembrance of the dead while the women go from grave to grave weeping over the lost. Once those passed have been properly mourned, the feasting can begin. 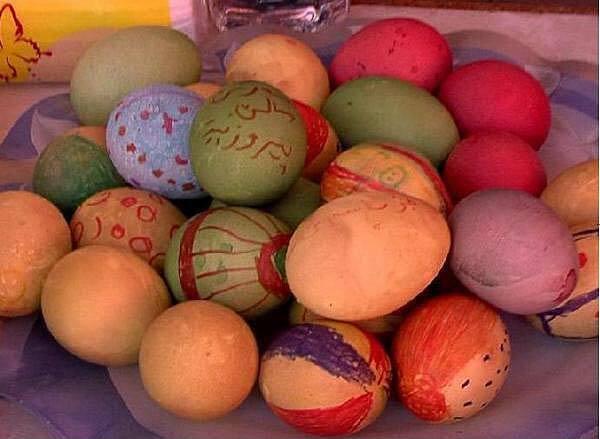 The colors of the eggs, including red, blue, green and yellow, represent the rainbow created by the Peacock Angel when he descended at Lalish to bless the earth with fertility and annual renewal. While the women mourn and prepare the feast, the men of the village go from house to house to visit with each other. It is important that every friend and acquaintance is visited and congratulated on the New Year. Missing anyone would be considered a great offense and could lead to severed relationships. Even their Muslim neighbors will visit to celebrate the holiday. Every visitor is offered candy, cookies, tea, and brightly colored eggs. The eggs not only symbolize new birth, but also are used in competitive games. Each person has an egg that they use to “fight” others. The eggs are tapped together (where they are struck is a matter of choice agreed on ahead of time) until one of them breaks. The owner of the whole egg is declared winner and gets to keep both his own egg and the defeated one. The feast is held communally and is a time for joy and singing. The mourning that came in with the dawn is forgotten in the joy of shared food. Some will take this time to visit shrines or climb holy mountains. Everyone decorates with colored eggs and red poppies. A special bread is also made and eaten during New Year. The crumbs of this special bread are left in the fields along wth the broken shells of the colored eggs. This is done to promote the fertility of the ground and the hope of a plentiful harvest. One more very special thing happens on New Year’s day. The banners and clothes that shelter the Peacock Angel are taken out of storage and baptized in the holy waters of Lalish. This is done in preparation for the Parading of the Peacock. This time of festival is when at least one of the seven Peacock Angel icons is taken to all Yezidi villages accompanied by some religious leaders. When the icon enters the village, there is a small parade as it enters the chosen host’s house. The icon is set up there and the men of the village come to pay homage to it. Generally, the men come in during the day to kiss the icon and give money as an offering. The religious leaders will sing songs and give sermons about the beliefs of the people. 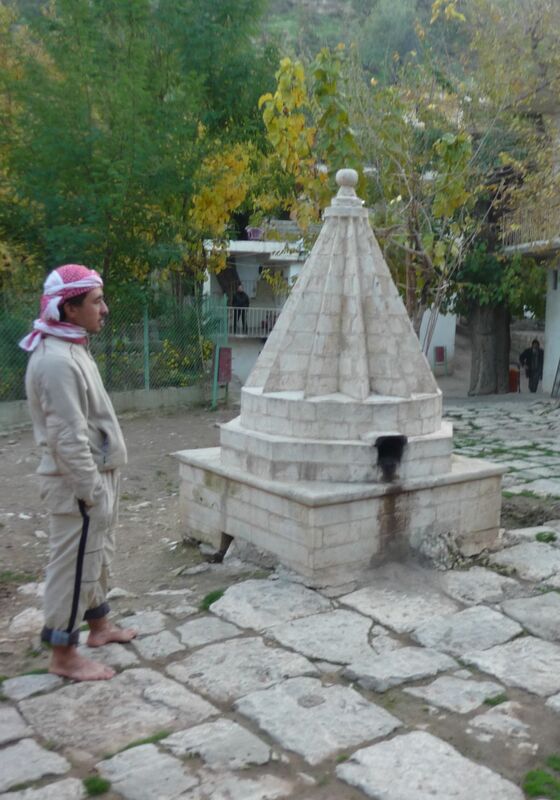 This is one of the few times that most Yezidis experience any form of teaching about their faith. The Parading of the Peacock is not necessarily an annual event. Sometimes the Peacock is not displayed due to concern over the safety of the icon itself. These holy objects are hidden away in places known only to a few. Even the route and dates of travel are not widely known. If it is deemed likely that the icon will be damaged or stolen it will not be taken out of hiding. 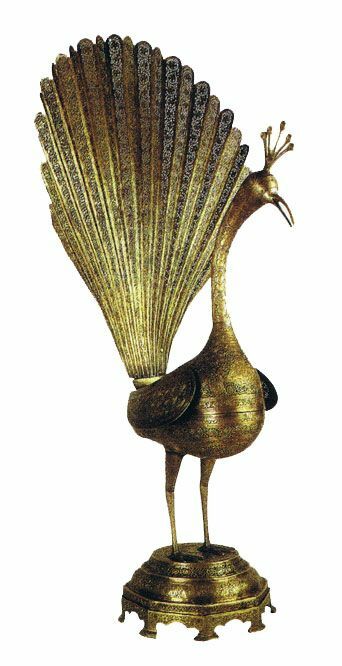 As a consequence of this secretiveness at least two of the seven Peacock icons have disappeared from knowledge. There is a fine balance between protecting the holy objects and this most important time of teaching their faith. So when the Peacock is displayed it is a time of great joy and rejoicing. The only other time of real doctrinal instruction is the yearly visit of the Baba Sheik. We’ll get into his role in the community in future sections, but for now, you need to know that he is the religious head of the Yezidi. The Baba Sheik spends his time visiting each village and spending at least one night in each. When he is in the village, everyone from that village, and ONLY that village, can come hear him preach, pray and help settle local disputes. His host family for the night is expected to not only host him and his entourage, but they also provide refreshment for the men who come to visit. This can be everything from tea, to fruit, to dinner and dessert. It can be a financial burden for the family. However, it is also a huge spiritual blessing. The highest and most important Yezidi holiday is the Autumn Assembly. It takes place during the last week of September or the first week of October in the holy city of Lalish. Lalish is believed to be the place where creation began and where the seat of God descended to rule the earth. It also houses the tombs of Sheik Adi and other holy figures. The town is considered so sacred that you are not allowed to enter it while wearing shoes, especially during Autumn Assembly. While singing hymns they then walk through the village to the main sanctuary of Sheik Adi’s tomb. They circle the building three times before kissing the doorframe and entering. They take their places around a five-branched torch and watch the first Evening Dance. The Evening Dance is performed each night for the duration of the festival. During the dance seven holy men, dressed in white, circle the sacred torch. The torch is meant to represent both God and the sun. They sing hymns as they pace slowly and solemnly. On the fourth day of the celebration, the clothes that cover and decorate the tomb of Sheik Adi are taken down and washed or baptized in the holy water of the Zemzem. They are prayed over, dried, and hung back in place. The process can be a long one, as each of the seven differently colored clothes (representing the seven angels) must be taken and washed separately. This is also the optimal time for those who have not been baptized in the waters to do so. One can collect a berat at this time too. These sacred clay balls are thought to bring protection and blessing to the household of the owner. On the fifth day of the Assembly, the Sacrifice of the Bull is completed. In this ritual, the main square of the sanctuary is surrounded by guards in uniform. After a short time, they fire their guns. The crowds are pushed back and a small bull is released. There are several men hanging on to the bull as it enters. This is to represent that the bull has “broken free” and has been chased into the sanctuary where it is ceremonially killed. Later the meat is cooked and given out to all who are staying in Lalish. The last ceremony of the week takes up the last two days. In it, the funeral bier of Sheik Adi is taken from its place in a different town and brought to Lalish. This is the only time this holy object is displayed. Holy men meet the bier at the Bridge of Silat to accompany it with songs to the sanctuary. Sheep and goats are sacrificed and a sacred meal is partaken in by the holy men. This assembly is much more than just a social or religious event. It is also one of the only times that all of the tribal and religious leadership are together in one place. In fact, if the main non-religious leader (the Prince) is not there, the assembly is not considered officially celebrated. Issues that are confronting the community, disputes and decisions regarding the future of the community are discussed during this time. There are other Yezidi festivals and pilgrimages as well. Not all of these are celebrated by the entire community and not all of them are necessarily exclusive to the Yezidi people. Most of these occur in the winter, although some of the pilgrimages can take place at any time. The most common is the Fast of Ezdi. This is actually three separate one day fasts performed over three weeks. The first fast is the Fast of Shems the sun angel. The second is the Fast of Xodan in which they fast for the safety and protection of their tribe. The final fast is the Fast of Ezdi which is another name for God. All Yezidis must observe this final fast, even if only the most religious observe the other two. In mid-February, there is a forty day fast that is only participated in by religious men. This is the Feast of Sacrifice which commemorates Abraham sacrificing his son. It is also remembered in the Muslim communities in much the same way. A sheep is sacrificed at the end of the forty days. This is the only festival that Yezidis celebrate based on the Muslim calendar. Much like their Muslim neighbors they are remembering God sparing Ismail (rather than the Judeo-Christian telling of Isaac) and Abraham’s great love for God, demonstrated by his willingness to sacrifice his own son. A horse and a greyhound instead of reindeer? Another brief holiday is the celebration of Xildir (or Khidir) Ilyas. Xildir and Ilyas are two holy figures in Yezidism who are almost always mentioned together. They may be represented by a horse and a greyhound.They are similar to Santa Claus in that they visit once a year and bring blessing to the households that leave a specific gift for them. This gift is a roasted mixture of seven grains. It is left as a remembrance of the times when all Yezidis had to eat was the grain left after their fields were burned by infidels. A plate of the mixture is left outside the house overnight. The next day it is checked for footprints. If the sacred footprints are there then the house will be blessed in the next year. Most towns and villages also have sacred tombs or shrines that they visit throughout the year. The appropriate time and reasons to visit vary from town to town. Most visits include prayer, hymns, collecting of berat, and some giving of alms to the keeper of the holy site. These smaller pilgrimages are generally taken only by the very religious. Read part one on Yezidi theology and practices HERE! Support our work to help displaced Yezidis and other minorities HERE!